Had a great skating weekend last weekend. I practised lessons 4-6 from Asha’s “How to Skate for Fitness” beginners course and also a bit of toe roll from the first set I did. These lessons are good because they all build on the first three, with variants on scooting and lunging. 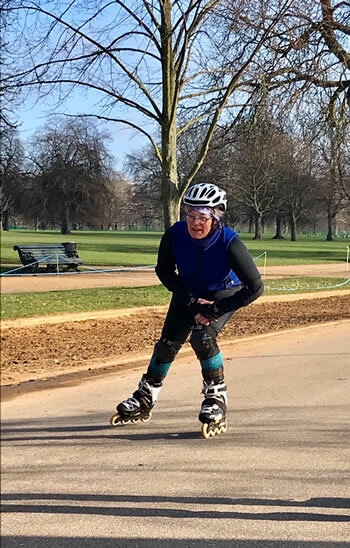 I find they are much more challenging for fitness than just going for a skate; just 30 minutes – 10minutes for each exercise, will make me work harder than a skate around the park. The one I found most challenging was the tapping while you lunge; one leg was weaker than the other. After I’d done them, I then played around with staying on one leg in a straight line for as long as I could, with a very slow recovery from the scoot leg. My strength and balance in the weight-bearing leg were improved from practice and I got some lovely long glides. Really pleased as I’ve been watching some videos of the Berlin inline marathon and visioning myself there doing that. I did the Sunday street skate on the weekend as well and I felt I was skating really well -able to cruise through gaps, stronger thrust and glide up the little slopes, and even stopped by turning around twice. So the practice, going back to basics and getting them right is helping with the objective of better street skating. …and I lost a bit of weight. Can’t say that is really the skating. It’s eating less. But being active and having objectives is certainly all part of it. Berlin in September. I’m coming at you! This weekend, weather permitting, I’ll have a skating lesson, and also practice lessons 7-9 in the Training Sequence.